Jacky Youldon’s running group helps suicide survivors and their friends and families find their feet again. These are the opening lines of the ‘Human Race’ article that will appear in the June 2019 issue of RunnersWorld, the world’s leading running magazine. RunningSpace was born out of a prophetic prayer in 2015. “When you run, you are the pioneer for the downfall of suicide”, and began with me volunteering to teach a small group of 6 non runners how to run. In the 3 years since, we’ve trained over 200 people, 80% of whom were completely new to running. Many participants have been affected by suicide, including myself – either attempting to take their own lives or having lost family or friends to suicide. Other attendees live with mental health conditions, from anxiety and depression to schizophrenia and autism. We have trained over 100 people in safeTALK, a World Health Organisation (WHO) ratified suicide prevention training programme. We are now looking ahead to the next steps in order to fulfil our mission. Our passion and calling are to see every life lived in all its fullness and not one be lost to suicide. By educating and training communities to become able, appropriate and available to those suffering with thoughts of suicide. By pioneering a worldwide movement of runners who will run, pray, and raise awareness for those affected by suicide. 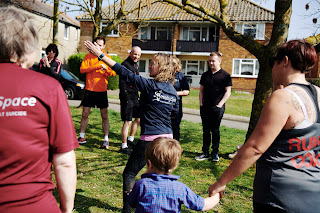 By working with communities to build prevention and recovery programmes which include Walk2Run groups, building relationship connections, developing links with clinicians, facilitating volunteering, and job creation for example. The World Health Organisation estimates that each year approximately 800,000 people die from suicide. This means that someone dies by suicide almost every 40 seconds. For every completed suicide there are an estimated 20 attempts: every 2 seconds someone in the world is trying to kill themselves. RunningSpace currently delivers 5 Walk2Run groups per week across Bexhill and Hastings, we have trained up 3 new coaches from within our own ranks, with a further 6 are about to begin their own coaching journey. Of those 9, at least 6 are survivors of suicide. Sessions are completely free, with free drinks to follow. Many people struggling with suicide and mental health are also struggling financially. Almost since inception, we have been based at The Pelham CIO in Bexhill with whom we share the same vision, to see people restored. The Pelham is a Christian endeavour, recognised for its contribution towards all aspects of health and wellbeing. RunningSpace has recently been adopted as a partnership project of the CIO, a mutually supportive relationship that enables us to offer connection, volunteering and other training opportunities, as well as share infrastructure and support through the CEO and The Pelham trustees. We are based in Bexhill, but of course suicide happens all over East Sussex, the UK, and the world. We have begun to receive requests to help people set up their own Walk2Run groups to beat suicide in other areas of Sussex and the South of England. We are now looking for financial help to support the next steps. Follow a social franchising model to enable us to expand without growing an organisation the traditional way that creates a distance from the ‘frontline’. Through building RunningSpace as a social franchise, we can benefit from the existing local expertise, experience and knowledge in other locations whilst spreading our message widely and consistently. Develop a training and mentoring programme to provide progression pathways for participants whilst at the same time increasing capacity. Produce resources and materials to support the delivery of Walk2Run groups ‘where you are’, following the proven and pioneering successful tools, skills and ethos we’ve worked hard on for the last 3 years. Begin the working out of the vision of the intercessory element of RunningSpace: develop a network of praying people, but also to deliver the first stages of a new project, Running in the Gap, to offer prayers, raise awareness or provide support for those affected by suicide. Build on the trusted status we have in Rother to further grow our connections with clinicians and other suicide support agencies. The Walk2Run groups are currently funded by Optivo, a local housing association, and the Heart of Sidley, a local Big Lottery fund until July 2019. Beyond this we will be raising funds from enterprise, grants, gifts and salary funding for future sustainability. In order to achieve the above, we are looking to grow a network of pray-ers and givers, those who would like to support the work in prayer and/or in finance. RunningSpace works. We have proven over 3 years that we can Run and Beat Suicide. Building on this solid foundation we ask you to join us in the vision to see every life lived in all its fullness and not one be lost to suicide.